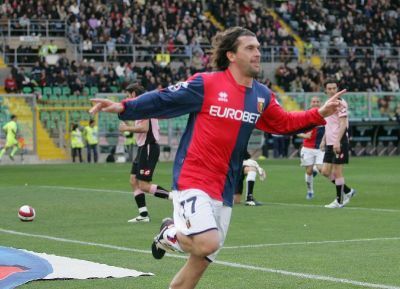 The members of Genoa Club Amsterdam have chosen Omar Milanetto as Genoa Club Amsterdam Genoano of the year 2007-2008. Our friendly playmaker was surely one of the best players of last season and the only one who was impossible to substitute. In modern football there are not much traditional playmakers anymore that start almost every offensive action of the team, but we are lucky to have one of the best in Europe: Omar Milanetto. Saturday at the Pegli-trainingfield we hand over our trophy to Hannibal, who hopefully can return in the team Sunday against Bologna and one week later be a part of the dream-midfield in the derby: Rossi-Milanetto-Motta-Juric. This morning almost every Genoa-supporter would sign for a draw in Rome against Lazio. Now after the match we can say that we lost 2 important points today. Man of the match was without any doubt Diego Milito. In the 40th minute Diego scored a goal that was 100% valid, but the linesman put his flag in the air because of off-side. An incredible error because Diego stayed behind the ball, in which case you can never be in an off-side position. In the 53rd minute the referee wanted to repair the big mistake of the 1st half by giving Sculli a dubious penalty. 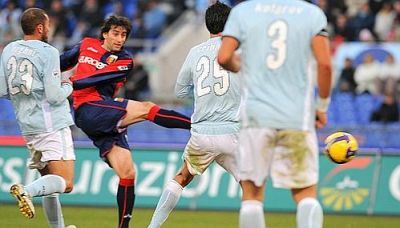 In the 3 seasons Milito plays with Genoa he never missed a penalty, but today he did by shooting a little too high. A regular player would be completely down after an irregular annulated goal and a missed penalty, but not our Diego. In the 69th minute a cross of Palladino ended by Mesto who gave the ball to Milito: 0-1. Exactly 10 minutes later Genoa was very close to double the score when Palladino got the ball by the goalkeeper of Lazio who had a lot of problems with a shot of Milito, but Raffaele failed to score. 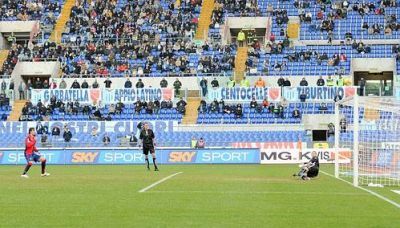 Within a minute on the other side Lazio scored the 1-1 equalizer, which was a big error of goalkeeper Rubinho. Our midfieldplayer with the lunghs of a horse, Giandomenico Mesto, is back in the team after his injury. Together with 19 other players he is selected by Mr. Gasperini and his staff to play against Lazio in Stadio Olimpico. Genoa will be supported by over 1000 supporters that make the trip of 505 kilometers towards the Capital of Italy. Last year Genoa beat Lazio by 1-2 with 2 goals (header and penalty) of Marco Borriello. Genoa misses the usual injured trio: Milanetto, Modesto and Paro, while Jankovic is not selected. Six players have to be carefull tomorrow because their next yellow card means a punishment: Biava, Bocchetti, Criscito, Juric, Rossi and Thiago Motta. 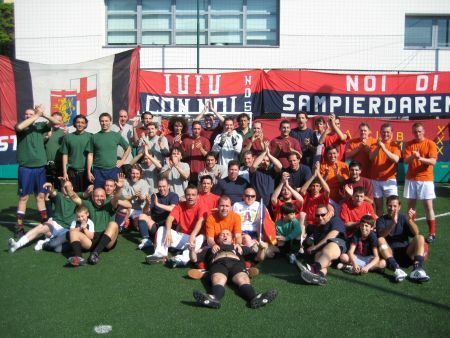 Last year the 1st edition of the Calcetto-tournament United in the name of Genoa was a big succes. Six nice teams from Toscany, Liguria and Holland showed up and played a fantastic and very friendly tournament that was perfectly organized by Lucca, Iccio and some other great Genoani. This year we come back from Holland with at least 2, but probably 3 teams to show Italy once again the famous Dutch total-football. We hope to see you all, including Mr. Gasperini and his complete staff, on Saturday 16th May 2009 for the 2nd edition of United in the name of Genoa. Unless the fact that it still takes 17 days and 2 matches before the derby will be played, the fever already has started! Monday-afternoon began the selling to the “visiting” seasonticketholders of Genoa, because on the 7th December we play an away-game in our own stadium in which Sampdoria is every 2 weeks our temporary guest since 1946. Because both teams together sold almost 43.000 season-tickets it is not possible to give entrance to all yearcards. Genoa-supporters only can visit the match in Gradinata Nord (9.167 seats) and the visitors-sector of Sampdoria besides Gradinata Nord with 2.079 seats. Unless the fact Sampdoria sold 2.818 season-tickets less they have the same number of tickets in May during our homederby, which they couldn’t even sell all last year. For the match in 17 days there are 5.257 single tickets which can be bought by Sampdoria-supporters without a season-ticket in the Sampdoria-shop. Many Genoani surely will act to be a Sampdoria-supporter for only 5 minutes the next days, only at the moment they buy the ticket to see another home-victory of the Gasperini-boys !! To substitute heavily injured Ruud van Nistelrooy the most succesfull club in the world Real Madrid wanted tot buy Diego Milito, topscorer in Serie A with 10 goals. Genoa’s owner Enrico Preziosi, who spend € 12 million last summer to let 29 years old Diego return from Zaragoza, does not even want to talk about a price with the club of the capital of Spain. Diego Milito is not for sale, over and out ! Both teams were equal and scored 3 times in the topmatch in Stadio Olimpico. Unfortunately a 100% regulary goal of Milito was annulated because of off-side and our Sokratis scored in his own goal, so we lost by 4-1. Mr. Gasperini started with Potenza and Gasbarroni in the line-up in stead of Sokratis and Sculli. 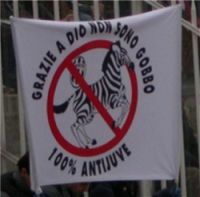 We will never know if this was maybe the reason that Juventus started much more agressive than our red and blue boys. Already in the 6th minute Grygera scored the opening goal with a strong shot behind Rubinho. Now Genoa was awake and the rest of the first half Genoa was without any doubt the best team in the field. We created many chances, but Ferrari (header just over the goal), Gasbarroni (ball on the post) and 2 times Milito (just besides the goal + irregulary annulated goal) forgot to score and on the other side Amauri scored the only chance of Juventus in the first half: 2-0. In the second half it was Genoa that started agressive and already in the 3rd minute Milito gave Raffaele Palladino the big chance to score 2-1, but our striker missed. After this big opportunity Juventus froze the match and it looked like it would end with 2-0, till Del Piero found Iaquinta in the 85th minute who scored 3-0. This was too much, but justice came within a few minutes when Legrottaglie played the ball with his hands (no yellow card of course) and Diego Milito again scored the penalty. Also the last goal was scored by Genoa, but substitute Sokratis chose the wrong goal: 4-1. Because of a match of the Italian rugby-team Genoa has to play already tomorrownight in Stadio Olimpico of Torino. A special match because our former Juventus youth-trainer Gasperini has brought 7 ex-players of the youth of Juventus in our red and blue team: Criscito, Palladino (both for 50% owned by the Old Lady), Sculli, Gasbarroni, Paro, Olivera and Milanetto (a fanatic Torino-fan unless the fact he played in the youth of Juventus). Besides the many ex-players Juventus-Genoa is also the match between the 2 best players in Italy last weekend: our topscorer Diego Milito and free-kick specialist Del Piero, while the other old star of Juventus: Pavel Nedved maybe tomorrow can leave the match without the red card he got the last 2 times. Injured goalkeeper and Genoa-supporter Buffon has some difficult decisions to make: does he watch the match on the vip-tribune or in the visitors-sector and what is stronger: his wallet or his heart?